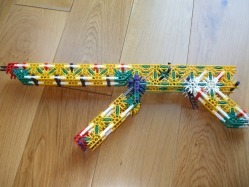 This knex AK-47 is a great beginners gun as it shoots elastic band and is extremely quick and easy to build. It looks great too and uses the minimum piece consumption for the fun you can get from it. Use stronger elastic bands for more power. Hope you enjoy building this knex model.